Last Summer, Michael and I spent a week visiting family in Portland, Oregon. While we were there, we took a drive to the Pacific coast. On our way to the ocean, we stopped off to visit the Tillamook cheese and dairy factory. Tillamook is one of our favorite cheeses, but seeing how it was made and the pride they take in their products turned us into even bigger fans. I was thrilled when Tillamook recently offered to send me some coupons for a few free packages of their sliced cheese to create a Summertime burger for my Grilling Week. I was really excited to get in the kitchen with some sharp cheddar to make an original burger. Not an ordinary burger, mind you…but my Cheesy Bacon-Onion Ranch Burgers. There’s not much better at a Summer cookout than a perfectly grilled burger. Add a quick homemade bacon-onion jam, melty Tillamook sharp cheddar and a creamy ranch spread…and you’ve got one great All-American burger on your hands. This recipe does have a few components to make, but it takes less than an hour to whip up these burgers for dinner if you multitask. While the onions for the topping caramelize, you have a pocket of time to whip up the creamy ranch sauce and season the ground beef. This burger smells so good while it’s cooking that everyone will be running to the grill or kitchen to find out what you’re cooking. These burgers literally explode with flavor, so they're perfect for next week's Fourth of July celebrations! Step 1: Make the bacon-onion topping by cutting 4 slices of applewood bacon into bite-sized pieces. Cook over med-high heat in a large non-stick until brown, then drain on paper towels. Remove all but 1-2 tbs. of the bacon grease from the pan. Add 1 diced sweet yellow onion and cook until it is tender and golden-brown, about 15 minutes. When the onion is golden-brown, add the reserved bacon, 2 tbs. agave nectar, and 2 tbs. balsamic vinegar. Stir to combine and cook for 5 minutes, until the sauce is a thick jam-like consistency. Place in a bowl and reserve until you're ready to assemble the burgers. Step 2: Make the ranch spread by adding the following ingredients to a small bowl: 1 cup whipped cream cheese, ½ package Hidden Valley Ranch dressing mix, 1 tbs. milk, and 1 tbs. Colman's mustard. Stir with a sturdy spoon until well until combined and set aside in the fridge. Step 3: Make the burgers by adding the following ingredients to a large mixing bowl: 1 lb. lean ground beef (I used angus sirloin), 2 tbs. Worcestershire sauce, ½ packet of Hidden Valley Ranch dry dressing mix, 2 tbs. 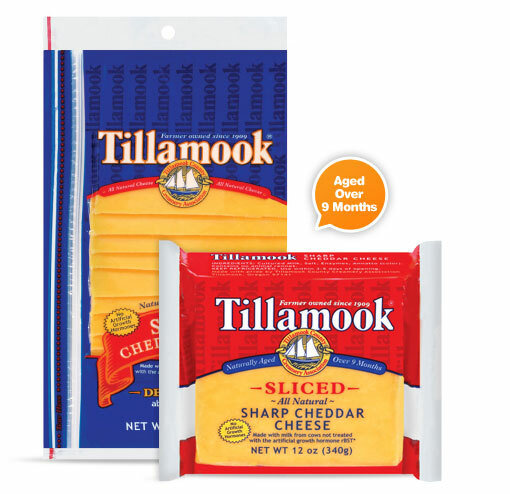 finely chopped shallot, and ½ cup Tillamook extra-sharp cheddar cut into ¼-inch cubes. Mix just until everything is evenly combined. Shape into four patties, and cook in a well-oiled grill pan over med-high heat for 5 minutes per side. Top each burger with a slice of Tillamook sharp cheddar and let it melt onto the patty. Step 4: To assemble the burgers, butter and toast four bakery whole wheat hamburger buns. Spread 2 tbs. of the ranch spread on the bottom bun. Top the bottom bun with a cheeseburger, then ¼ of the reserved bacon-onion jam. Add the top half of the bun, cut in half with a serrated knife, and enjoy. These burgers are so good…the bacon-onion jam is a fabulous combo of sweet, sour and smoky! It pairs perfectly with the double shot of gooey Tillamook cheddar and the creamy ranch spread. The addition of Colman’s mustard to the spread gives it a nice background kick. Add it all up, and you’ve got one fantastic burger on your hands! I served these burgers simply with crispy potato chips and root beer for a simple weeknight dinner. For July 4th, I plan to pair these burgers with fresh sweet corn that's slathered with butter and salt. I hope you’ll add these burgers to your next grilling adventure. They’re dude-approved and very hearty. Disclosure: Tillamook sent me coupons for free packages of their sliced cheddar cheese and Colman's provided me with a jar of their mustard to facilitate recipe development for this article. The opinions expressed are my own.